Please provide the application in the customer comments box at checkout, or Contact Us with the application. There are three different resistors available, and we must have this information before your order can be processed. The application is important to ensure you receive the correct resistor. We need to know the year, make and model as well as the a/c type (manual or auto). We also need to know if your vehicle has bucket seats and a center console. 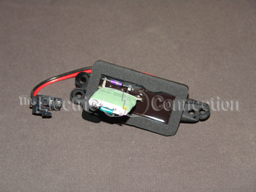 To order the resistor and the wiring harness, click here. From Daniel D. of Hawthorne, Florida on 9/12/2012 . From Robyn of Sterling, Virginia on 1/4/2012 . 12/23/2010 – I see that the part that I am looking at has a note *Without center console*. I have the center console in my truck, what . . .
4180 Repair Harness ONLY, for Blower Motor Resistor Chevrolet & GMC Trucks '90 and up – Seven wire repair harness for multiple resistors.